Here's a list of Chapter 1 - Check Your Six Task Missions that you need to complete in order to Master the Chapter. You may also use the Chapter 1 Missions and Stages below as your reference for finding locations of certain enemies or villains. - The free Hero Reward for Mastering Chapter 1 is Electro. - Task: Assign a Hero who is not Hawkeye to be Leader of the Strike Team. - How to Complete: Just change the Leader of the Strike Team before entering a stage. - Task: Defeat Syndicate members in Mission 1.1, 1.2, 1.3, 1.5, or 1.6 [25 Times]. - How to Complete: Enter Sinister Syndicate stages and defeat them. - Task: Apply Exposed effect to Syndicate members in Mission 1.1, 1.2, 1.3, 1.5, or 1.6 [5 Times]. - How to Complete: You can check Heroes with Exposed Effect here: Physical Debuffs List. Either use your own hero, or team-up heroes. - Task: Defeat the Hydra Power Armors in Mission 1.1 [3 Times]. - How to Complete: Hydra Power Armor is the 1st Mini-Boss in Mission 1.1. - Task: Use an attack with the Shock tag on a Hydra Power Armor in Mission 1.1 [3 Times]. - How to Complete: Check your Heroes if one of their abilities has a Shock "Attack Type Tag". If none, browse the available Hero-Team Ups for the stage, then check their abilities from the Heroes Screen. Choose someone that can deal a Shock attack. Some of the common Heroes are Wasp, Hawkeye's Stun Arrow, Spider-Woman, and more. - Task: Defeat Doctor Octopus in Mission 1.1. - How to Complete: He can be found as the Final Boss in Mission 1. Only use abilities with Unarmed "Attack Type Tags" to damage and defeat him. Some of the common heroes are: Luke Cage, Iron Fist and more. - How to Complete: It is also possible to wait it out until your Heroes are strong enough to deal massive damages. - Task: Defeat A.I.M scientists in Mission 1.3 [25 Times]. - How to Complete: Enter A.I.M. stages and defeat them. - Task: Apply the Hindered effect to A.I.M scientists in Mission 1.2, 1.3, 1.4, or 1.5 [5 Times]. - How to Complete: You can check Heroes with Hindered Effect here: Tactical Debuffs List. Either use your own hero, or team-up heroes. - Task: Defeat Mysterio in Mission 1.2. - Task: Apply the Dazed effect to Mysterio in Mission 1.2 [3 Times]. - How to Complete: You can check Heroes with Dazed Effect here: Mental Debuffs List. Either use your own hero, or team-up heroes. - Task: Defeat Boomerang in Mission 1.3. - How to Complete: Defeat the first Mini-Boss in Mission 3. - Task: Defeat Rhino in Mission 1.3. - Task: Apply the Stun effect to Rhino in Mission 1.3 [3 Times]. - How to Complete: You can check Heroes with Stun Effect here: Uncategorized Debuffs List. Either use your own hero, or team-up heroes. - Task: Defeat Hydra soldiers in Mission 1.4 [25 Times]. - How to Complete: Enter Hydra or Hydra Power Armor stages and defeat them. - Task: Apply the Intimidated effect to Hydra Soldiers in Mission 1.1 or 1.4 [5 Times]. - How to Complete: You can check Heroes with Intimidated Effect here: Mental Debuffs List. Either use your own hero, or team-up heroes. - Task: Defeat Electro in Mission 1.4. 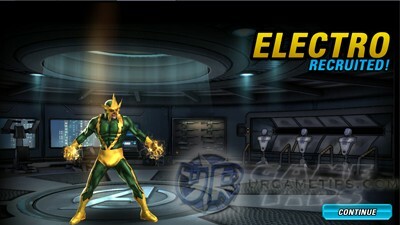 - Task: Defeat Electro without being affected by his Static Shock effect in Mission 1.4. - How to Complete: I was able to complete this early because of Wasp, use her "Protecting" skill with high evasion stat to avoid Electro's Static Shock attack and effect. Static Shock is a Physical Debuff, so using Iron Fist's Healing Lotus for example will also prevent the effect. - How to Complete: It is also possible to wait it out until your Heroes are strong enough to deal massive damages before he can act, or high dodge rates to avoid attacks. - Task: Defeat Shocker in Mission 1.5. - Task: Defeat Lizard in Mission 1.5. - Task: Green Goblin in Mission 1.6. - Task: Defeat Paladin in Mission 1.2 (Hard). - How to Complete: Defeat the first Mini-Boss in Mission 2. - Task: Defeat Living Laser in Mission 1.3 (Hard). - Task: Hit Lizard with Unarmed attacks in Mission 1.5 or 1.6 (Hard) [3 Times]. 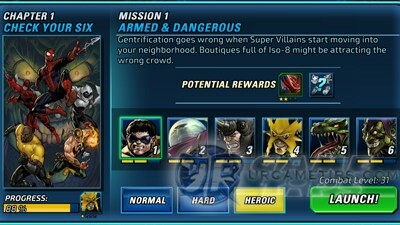 - How to Complete: Some of the common heroes with lots of Unarmed attacks are: Luke Cage, Iron Fist and more. Either use your own hero, or team-up heroes. 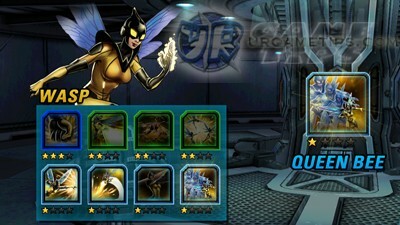 - I highly suggest at least a Lvl 30 2-Stars Wasp with 3 or 4-Stars Queen Bee, Stinging Barrage, and Bioenergy Blast. Reach at least 4,500~5,000 Evasion, and 3000 Speed. - The other 2 heroes can be any Lvl 30 decent heroes, preferably with a good survivability and damage output to at least survive the first few attacks before you can start Wasp's Queen Bee ability ("just in case"). Note: If you just need Wasp to tank and try other team compositions, that is also cool. - Task: Defeat Epic Boss Green Goblin in Mission 1.4. - How to Complete: Goblin Serum gives +50% Evasion and Speed to Green Goblin, but Serum Overdose will make him vulnerable for a while, use this window to Attack, Recharge, or to apply your Debuffs. Stun attacks will also prolong his own debuff. - Example Team: Wasp, + 1 Healer, and a hero with Static Shock debuff or any decent DPS hero. - Example Team: Wasp + 2 Stunners, preferably those that can inflict Static Shock debuffs. - Example Team: Wasp + Any 2 decent Heroes you like, best if you have a backup Healer. - Task: Defeat Epic Boss Graviton in Mission 1.6. - How to Complete: Graviton is a "Flanker" with lots of AoE attacks, so Protecting isn't gonna help much here. He can also use Shields but you can bring it down by using abilities with "Shield Breaker" like Wasp's Bioenergy Blast, before dishing out damages. Using Galactic Iso-8 Set should also work if you can equip one. - Tacticians are Graviton's counter class, so he is also strong against Bruisers. - I highly recommended 3 or more 2 to 3-Stars Lvl 30 heroes, with 3 or 4-Stars key abilities, and decent Iso-8 setups (Fragments and Shards). All Stats should be around or at least 2500 especially Health. - For healers, better focus their Iso-8 Crystals on Health, Defense, Speed, and Evasion to heal and survive longer. Yup, it's what I did to my 1-Star Iron Fist to survive. - Example Team: Wasp (tank for early waves; for shield breaker and demoralized) + High Evasion hero like Black Widow (DPS and static shock) + any decent Healer or DPS hero. - Task: Complete all Mission difficulties. - One of the best heroes for free-users and Static Shock teams! Yay!